In a way, the Huon piners had it easy: Row 20–50km across the Harbour and up a river, find a place on the steep banks to get out of the dinghy, walk a few paces into the forest to find a good Huon pine tree, spend all day with axe and crosscut saw cutting it down, and then spend another day with block and tackle moving the log into the river, a few weeks later gather up that log and its mates at the boom at the lower end of the river, and then slowly tow them across the Harbour – at about 1-2km per hour – to the sawmill. Easy. Well, maybe not easy, but the work of a Huon piner required mainly strength, stamina and dedication, without much infrastructure. King Billy piners, on the other hand, needed to be engineers and road builders, on top of muscle and resilience. Huon pines grow on riverbanks and the logs float green, so the piners could use the rivers as roads. King Billy pine, on the other hand, grows on mountain slopes above 700m where the numerous little streams which form a river’s headwaters provide a man with difficulty in navigating across them, but no help in getting the timber down. 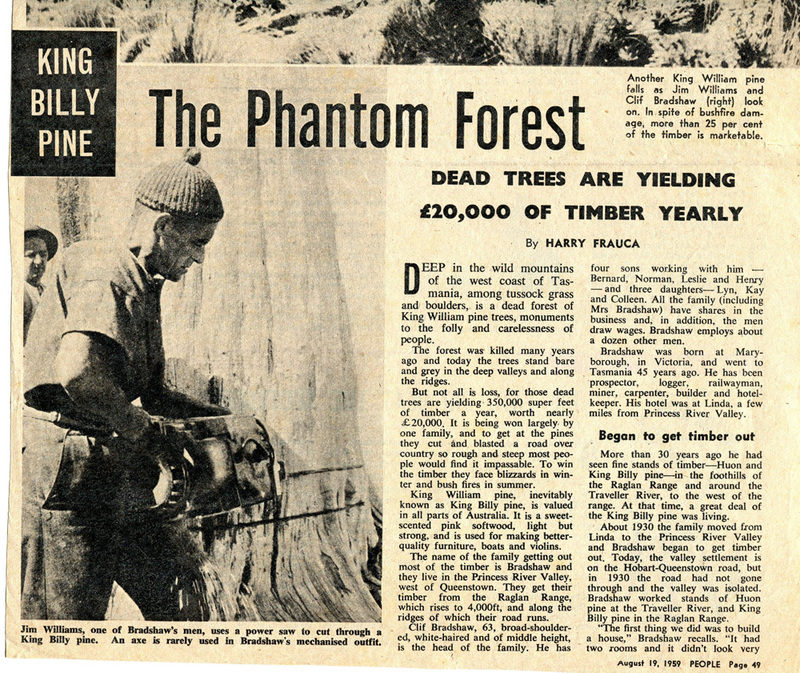 The determined and resourceful men who obtained King Billy pine – whether dead and salvaged, or green – needed to get heavy vehicles to the top of steep mountains to carry out the logs. They had to build their own roads, in very steep country, where 3 metres of rain a year guaranteed that any cleared ground would quickly become a bog or a man-made rivulet. The most famous of these is the road built by the Bradshaw family in the 1950’s and 60’s from the Lyell Highway up onto the Raglan Range. Driving along the Highway from Queenstown towards Hobart, those with a keen eye can still spot the outline of the road as it pushes up a steep buttress between Nelson Falls and Victoria Pass, although a fire through that area in 2016 has helped obscure it. 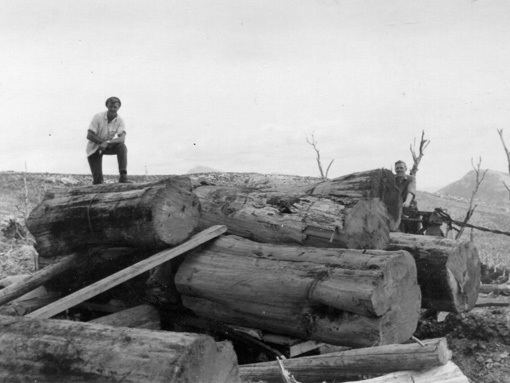 In the late 1950’s Cliff Bradshaw’s sawmill was a few kms east, at Princess River, and he was tasked by the state government with salvaging the King Billy pines which had been killed by fire in a huge blaze in 1896 which ripped through much of western Tasmania, and another in the 1930’s. There would be another fire through that area in the 1960’s which killed more precious ancient trees, and burnt up very close to the top of Frenchman’s Cap. 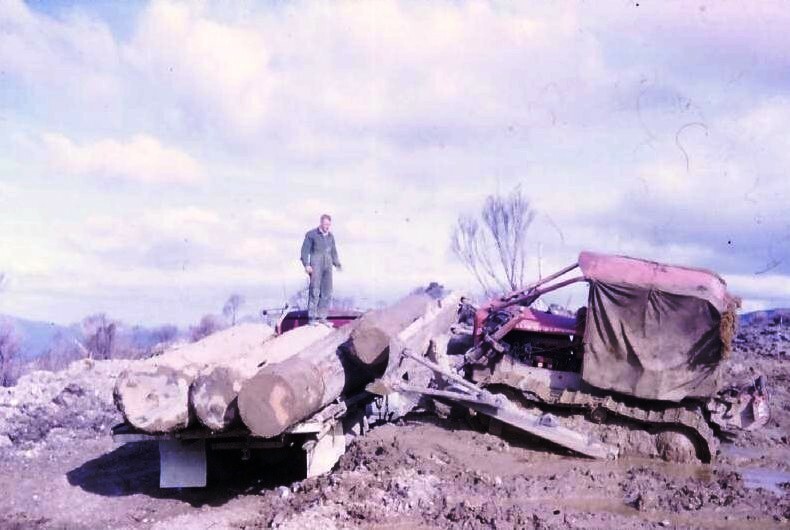 The Bradshaw crew built a road so steep that legend held that the trucks were reversed up it to provide better traction, and the drivers were quoted as saying that there were times that they could not see any land when looking over the bonnet of the truck, only sky. It must have taken some nerve to drive the vehicles up there empty, let alone back down the hill with many tonnes of timber on the back keen to demonstrate how gravity works. Pottering across Macquarie Harbour with logs bobbing along behind would seem easy compared to that.